Living in Connecticut, I rarely experience extreme weather. Last year was an outlier. The winter was brutal, then came the remnants of Hurricane Irene (not in itself extreme but nonetheless a week-long power outage), and finally the freak Halloween snow storm (and, yes, another week without electricity). Although there was undoubtedly a spike in generator sales, let’s face it: no investor is going to make much money betting on Connecticut weather. In Extreme Weather and Financial Markets: Opportunities in Commodities and Futures (Wiley, 2012) Lawrence J. Oxley takes us to where weather is genuinely extreme and where real money can be made. Wending his way through the various commodities and ways to trade them, he focuses on five potential global climate shocks: excess snow and ice; flooding mines; farmland droughts, floods, and frost; hurricanes and tornadoes; and timberland fires. Let’s take a look at a single commodity, which the author says “may well be [his] favorite weather-based investment”—platinum. Platinum enjoys strong global demand, the supply side is highly concentrated geographically (South Africa accounts for 76% of total platinum mine production), and these geographies have the potential for politically rooted supply shocks. Oxley does not, however, confine his analysis to trading commodity futures. He gives examples of pairs trading in equities and explores opportunities in the bond and forex markets. Event-based trading is notoriously difficult because everybody is responding to the same information. Think, for instance, of the recent run-up in orange juice after a cold snap threatened Florida’s crop, the FDA detained shipments of oranges imported from Brazil in which they found traces of an illegal fungicide, and Mexico’s crop faced damage from drought. Even with this perfect storm trading was still not easy. For instance, on January 10, when news of Brazil fungicide fears broke, orange juice surged 11%. The next day, as investors awaited more news from the FDA, orange juice futures fell 9.5%. Here’s the 30-day chart. Oxley’s book is a worthwhile read for commodity investors, novices as well as the more experienced, who are in search of opportunities. It is also a cautionary tale for those who want to protect their portfolios. No one should trade commodities without understanding the impact extreme weather can have. Fusion Analysis: Merging Fundamental, Technical, Behavioral, and Quantitative Analysis for Risk-Adjusted Excess Returns (McGraw-Hill, 2012) is based on a course V. John Palicka offered at the New York Institute for Finance. As the subtitle indicates, the book advocates a multi-pronged or, perhaps better put, a blended approach to investing. Palicka’s general approach is not new. Many stock screeners and investment services score stocks using a variety of inputs. For the investor who wants to do it himself, however, it’s not always obvious what kinds of inputs make the most sense—and potentially the most dollars. It’s also not intuitive what the theoretical underpinnings of the various approaches are. For instance, in a somewhat philosophically muddled chapter that touches on faith, physics, and time travel the author argues that determinism (here most frequently contrasted with free will) is the basis for technical analysis. Palicka throws a lot at the reader in this book. He blends Elliott Wave analysis with the fundamentals of real estate within the context of determinism. He studies gold trading and business cycles, describes buy and sell decisions using Gann analysis, outlines measures for risk-adjusted excess returns (Sharpe, Treynor, Jensen Alpha, and the Information Ratio), and explains how to use swaps for market timing. Fortunately Palicka provides a case study (Steve Madden—SHOO) to illustrate how the fusion process works. He uses a scoring system to determine a rating but cautions that “my actual and proprietary system may differ from that illustrated for confidentiality reasons.” (p. 374) In his illustration he incorporates five categories—short-term return, price/book, expected P/E divided by the expected P/E on the S&P 500, price/cash flow, and technical (a weighted average of MA, support/resistance, MACD, OBV, market relative strength, and Fibonacci). The categories are weighted—in this case between 10% and 35%--and each category gets a rating. So, to determine the total rating you simply take each individual rating times its weight and sum the products. Then you compare the summed rating to a table which correlates ratings (buy, buy/hold, hold, sell/hold, sell) with points. If, for instance, in this example the total rating is under 1.5, the stock gets a buy rating. Of course, in the investing world nothing is cut and dried, and Palicka’s book makes that patently obvious. Backtesting helps, numbers are critical, but ultimately fusion analysis relies on market experience, the integration of disparate fields of study, and the touch of an artist. Even though I doubt that the author would find this an apt description of his method, I intend it as a compliment. Brown, Technical Analysis for the Trading Professional, 2d ed. When I requested a review copy of this book, I forgot how much I disliked the first edition. Either I’m getting soft or Constance M. Brown has substantially improved the second edition. Probably a little bit of both. By the way, for those aspiring to be certified in the Chartered Market Technician program it is required reading. Technical Analysis for the Trading Professional: Strategies and Techniques for Today’s Turbulent Global Financial Markets (McGraw-Hill, 2012) is still not a book that I would turn to for core trading strategies. On the fringes, however, it can be useful. And this is important because, as I have argued before on this blog, it is often by making even minor changes at the periphery that returns are substantially improved. Brown relies primarily on Fibonacci projections, Gann analysis, and the Elliott Wave Principle for her trading. She also adds a couple of oscillators to her charts, including her Composite Index, for which she now provides the formula. At practically every turn Brown offers a twist on commonly accepted tenets of technical analysis. Take something as seemingly simple as trend lines. She devotes an entire chapter to the argument that dominant trend lines are not always from extreme price highs or lows. Her trend lines sometimes look like the ones I draw (which, of course, make them ever so smart). At other times it’s difficult to follow her logic; the choice of pivot points seems idiosyncratic. Brown’s book is definitely not for the novice trader. Without a solid foundation in classical technical analysis (and here I include Fibonacci, Gann, and Elliott) the reader would be utterly lost in the twists and turns of Brown’s original work. The author’s earlier writings were often shrouded in mystery, aka “teasers.” In this book, by contrast, Brown makes an honest effort to share the ideas she has honed over the years. I always figure that if I get one good idea from a book it was worth the read. Technical Analysis for the Trading Professional over-performed. Some days I simply can’t stay focused, and Saturday was one of them. I watched the snow accumulate. I thought about what I really want to do when I “grow up,” a theme that recurs about as frequently during the day as do my dreams of approaching graduation a credit short or walking into the final exam of a course I never attended. In my dreams, by the way, I am not so much the panicked student as the unprepared brash risk taker who skates by. Enough said. But perhaps not enough said, and this brings me to a book that is scheduled to be published by Penguin Press in June—The Hour between Dog and Wolf: Risk Taking, Gut Feelings, and the Biology of Boom and Bust by John Coates. Well, clearly, I don’t have a copy of the book, but I took a look at the papers Coates published a few years back. For those who care about credentials, I’ll quote from Penguin Press’s summer catalogue: “Coates is a senior research fellow in neuroscience and finance at the University of Cambridge. After completing his Ph.D. Coates worked for Goldman Sachs, Merrill Lynch, and Deutsche Bank in New York, where he observed the powerful emotions driving traders. He returned to Cambridge in 2004 to research the effects of the endocrine system on financial risk taking.” His Cambridge faculty page has links to four short papers available online in .pdf format. Interesting stuff, definitely worth a quick read. If the publisher is generous, I’ll have more to say on the topic this summer. For the directional trader with a small trading account binary options might be an attractive opportunity. The Chicago-based Nadex (North American Derivatives Exchange), for instance, will open an account with no minimum funding, and to trade a single contract one needs no more than $100. Of course, depending on the structure of the trade, that money might disappear in the blink of an eye since for those trades held to expiration (which might be intraday, daily, weekly, or event-based) winning contracts are worth $100, losers worth nothing. Before retirees rush to deposit their Social Security checks with a binary option broker and stay at home buying cheap out-of-the-money calls instead of going to Atlantic City and shooting their wad on a one-armed bandit they—and, naturally, all other traders—should learn a great deal more about binary options. Abe Cofnas provides a good introduction to this instrument and also offers insights on directional trading in Trading Binary Options: Strategies and Tactics (Bloomberg/Wiley, 2012). Those traders who have shied away from options because they seem complicated may be relieved to learn that understanding the Greeks is not essential in the world of binary options. Yes, market makers use them to price the binaries and Cofnas even introduces the reader to volatility smiles, but the trader’s major decisions are whether to buy or sell binary options and at what strike price. How much does he think the market will move in a given length of time and in what direction? At expiration he will either be right or wrong and will either collect his $100 or lose whatever he paid to put on the trade. We all are familiar with the “no free lunch” principle. In this case, the speculative trader who opts for the simplicity of binary options has to be very good at predicting and timing market direction. (Hedgers can of course also use binary options, but this book is written primarily for the retail speculator.) Cofnas devotes four chapters to tools the binary options trader can use to improve his skills: sentiment analysis, macroeconomics and the currency markets, technical analysis, and volatility tools. He then fleshes out the five basic binary option trading strategies—in-the-money, deep-in-the-money, at-the-money, out-of-the-money, and deep-out-of-the-money—using examples from the Agora newsletter he writes. The trades were in gold, the DAX, crude oil, currency pairs, and the S&P 500. Some were sentiment based, others event driven. He devotes an additional chapter to strategies for analyzing event risks. The book concludes with chapters on risk management, evaluating and improving trading performance, algorithmic approaches to binary option trading, and a 50-question quiz. Cofnas’s book should be useful to anyone considering adding binary options to his trading portfolio. A beginner can understand it, an intermediate trader can profit from it. Fabozzi, The Handbook of Fixed Income Securities, 8th ed. You thought War and Peace was daunting? The original edition of Tolstoy’s masterpiece was a mere 1,225 pages. The text of the eighth edition of The Handbook of Fixed Income Securities, edited by Frank J. Fabozzi with the assistance of Steven V. Mann (McGraw-Hill, 2012) is 1,810 pages long. When you add the thirty pages of front matter, you end up with a five-pound book. The previous edition of this handbook was published seven years ago. To catch up with the changing times, this edition adds 31 new chapters and about 300 more pages. Subsequent handbooks will probably best be published as two-volume sets. As you might well imagine, I did not read the book in its entirety before writing this review. But, having dipped into it, I consider reading the whole to be a worthwhile project. If I proceed at the rate of a couple of chapters a day, I will have devoured it in about a month and figure I will have a pretty solid understanding, at least on an elementary level, of the fixed income market. The book is divided into ten parts: background, government securities and corporate debt obligations, securitized products, term structure of interest rates, valuation modeling, credit risk, multifactor risk models, bond portfolio management, derivatives, and performance evaluation and return attribution analysis. Although some of the authors of the 71 chapters are academics, most are practitioners. The book is written for those who want a broad overview of the bond market without getting bogged down in the math on which the bond market depends. Investment professionals (especially those on the equity side whose knowledge of the bond market is weak), financial advisors, and individual investors could all profit from it. There may be more in this book than most people would ever want to know, but there is definitely a lot that they should know. Denise Shull, founder of the risk and performance advisory consulting firm ReThink Group, argues that traders and investors will improve their bottom lines if they better understand their emotions. Numbers, she writes, “look you in the eye and lie.” Both rationalism and empiricism come up short. The key to market success lies in leveraging emotional introspection and analysis into informed trading behavior—first and foremost, risk management. In Market Mind Games: A Radical Psychology of Investing, Trading, and Risk (McGraw-Hill, 2012) Shull argues that we would “be able to extract a powerful advantage if we spent more time logically analyzing what the numbers cannot tell us.” (p. 20) Quantitative analyses are merely clues, not answers to what all traders are trying to figure out—other players’ future perceptions. To be a successful trader it is not enough to read the markets. Traders must also read themselves to figure out (not control) what feelings, physical and emotional, are fueling their judgment calls. Feelings should be viewed as data to be captured and then analyzed. “Just like if you had any new data set to work with, first you would try to get the scope of it, look at it from different angles to get a sense of what you were dealing with, and then go about ways to monitor, track, and categorize.” (p. 125) Knowing yourself and knowing how you feel (your emotional contexts) at any given time will give you a risk management edge. It will help you avoid those “What was I thinking?” moments. Shull spends several chapters describing some of the most common emotions traders bring to their decisions. For instance, she asks the reader to determine where he is on the spectrum between the fear of losing money and the fear of missing out. Shull offers some practical suggestions, from getting enough sleep to recording what you’re feeling as you trade. She may be a little too eager to have traders unload their psychological baggage on their parents, but it’s easy enough to opt for an alternative psychological theory to understand and deal with emotional problem areas. And we all have them. Admittedly, Market Mind Games repeats what others have said before—that the market is in your head. But now neurological research is providing a scientific basis for taking this claim seriously. And Shull’s foray into epistemology offers the outline of a systematic framework for making sense of it. All in all, a provocative read. Morris, the author of Candlestick Charting Explained, the third edition of which was published in 2006, has now written a companion workbook, Candlestick Charting Explained Workbook: Step-by-Step Exercises and Tests to Help You Master Candlestick Charting (paperback, McGraw-Hill, 2012). Although I assume both author and publisher hope that the publication of the workbook will revitalize sales of the original text, the workbook can stand on its own. In general, I’m not a fan of workbooks. But perhaps because I don’t have the Urtext on hand I found Morris’s workbook exceedingly well crafted. It describes and gives chart examples of reversal and continuation patterns—from such well-known ones as the bullish and bearish engulfing patterns to the more obscure (and rare), such as the concealing baby swallow. There are frequent tests. I will confess that I started with the tests, figuring that I knew a fair amount about the intricacies of candlestick charting. “Knew,” past tense, is probably the operative word. If I had charted my performance, I wouldn’t have been the star of the class. Well, that was a bummer, so I had to go back and actually read the book. But it was a good read, so I didn’t feel that I was doing penance for a failed memory. 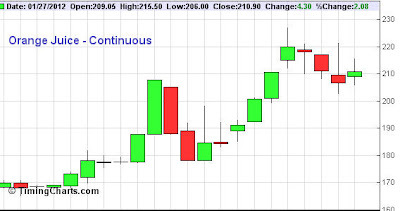 Does a chartist have to know all the candlestick patterns to be successful? Of course not. Can a trading method based on candlestick patterns alone be profitable? Perhaps, though with major caveats. Morris himself claims that trading solely on candle patterns is not wise. He advocates combining candle patterns with momentum indicators, at the very least. In fact, his MetaStock add-on scores patterns using a range of inputs. In whatever way traders decide to use candlestick patterns, Morris’s workbook is both a good introduction and a quick refresher course. It’s commonplace for authors to write revised editions of their books. But book reviewers are not supposed to serve up revised editions of their reviews. The former are billed as new and improved; the latter seem nothing more than warmed-up fare. The problem is that sometimes it’s difficult to start from scratch when reviewing a book that, while completely new, is also identical in structure. Such is the case with the 2012 edition of the Standard & Poor’s 500 Guide. So, with apologies, herewith a revised edition of last year’s review. Second, the two pages devoted to each company in the S&P 500 are jam-packed with data, including ten years of company financials (per share data, income statement analysis, and balance sheet and other financial data), five years of revenue and earnings per share, and the four most recent dividend payments. The summary of the company’s business is also more analytical than the run-of-the-mill online fare. Third, and taking up almost half of the space allocated to each company, is proprietary S&P information, ranging from analysts’ reports to the famous five-star system of investment recommendations. I complained last year that the analysts’ reports were not especially timely; some dated back to July and the most recent were from October. This year’s edition has remedied that problem. Most analyses and business summaries were written in November; closing prices for stocks are from late November. Other data include S&P’s qualitative risk assessment, its quantitative evaluation, and each company’s relative strength rank. For each stock there is also a price chart from June 2008 through November 2011 overlaid with S&P proprietary metrics. The book is somewhat unwieldy to handle (it’s definitely best read on a desk, which I personally find awkward), but this is a small price to pay for the amount of information available. It will find a place on my shelf next to last year’s edition. In The Hedge Fund Mirage: The Illusion of Big Money and Why It’s Too Good to Be True (Wiley, 2012) Simon Lack draws on a long career in the hedge fund industry. The result is a chatty, personal history of hedge funds and a critical look at what they offer (and mostly don’t offer) investors. The very first sentence of the book is a stunner: “If all the money that’s ever been invested in hedge funds had been put in treasury bills instead, the results would have been twice as good.” Contrast this stark reality with the money earned by hedge fund managers. In 2009 the top 25 hedge fund managers collectively earned $25.3 billion. No wonder one of Lack’s chapters is entitled “Where Are the Customers’ Yachts?” referencing the classic book of that title. Lack set up JPMorgan’s incubator funds that provided early stage funding, or seed capital, to new hedge fund managers. Typically, they would offer $25 million of capital in exchange for 25 percent of the business. “The business share would come, not through a direct equity stake in the manager’s company, but through carving off 25 percent of the fees earned from all the other clients.” (p. 40) That is, they would earn a share of the top line, before expenses, and be at least in part protected from investing losses. Moreover, Lack encountered a firm that played fast and loose with the valuation of its portfolio. When Lack’s group decided to exercise its escape clause in the face of a deteriorating convertible bond market and withdraw half of its capital, the fund switched from valuing its holdings at mid market to using the “Bid NAV.” The group felt they’d been had. “Fortunately,” Lack writes, “we were able to turn the trick back on them two months later” when the fund managers artificially boosted their performance as the market bounced back by using the “Ask NAV” to value their bond portfolio. Lack’s group cashed out the rest of its holdings at the higher valuation. In this book Lack names names—the good, the bad, and the slouches. He offers pointers on how to invest wisely in hedge funds, his best idea being to opt for a small, new hedge fund. And, of course, do lots of due diligence. Lack’s experience shines through on every page of The Hedge Fund Mirage. Hedge fund investors, and anyone who is even contemplating investing in a hedge fund, would do well to take advantage of it.